Istria, in the northern part of superyacht hotspot Croatia, is one of the most popular holiday destinations for visitors to this magnificent region. Formerly a part of Italy during the early 20th century, the peninsula of Istria borders Slovenia and shares a maritime border with Italy, but overall still carries a strong Italian influence. From the smaller holiday resort town of Umag to the most popular resort town of Porec and the historic old town in Rovinj, Istria is a destination that is not only rich in culture and history but is also enchanted by majestic scenery. Whether you plan to discover this part of of Croatia on a luxury yacht charter or with your own private yacht you’re guaranteed a memorable adventure. Day 1:Pula Fly to Pula in Istria and take in the sunset around Pula’s remarkable Roman amphitheatre. Even better, if it’s film festival time you can catch an open-air screening inside the arena. Dine in style at Valsabbion and savour innovative cuisine using the best of the region’s produce. After dinner, rejuvenate and enjoy the view from Valsabbion’s top floor spa and sleep the night away in the luxury of its exquisite rooms. Istria, in the northern part of superyacht hotspot Croatia, is one of the most popular holiday destinations for visitors to this magnificent region. Formerly a part of Italy during the early 20th century, the peninsula of Istria borders Slovenia and shares a maritime border with Italy, but overall still carries a strong Italian influence. 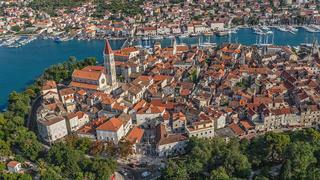 From the smaller holiday resort town of Umag to the most popular resort town of Porec and the historic old town in Rovinj, Istria is a destination that is not only rich in culture and history but is also enchanted by majestic scenery. 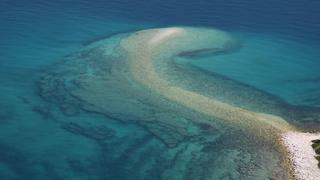 Whether you plan to discover this part of of Croatia on a luxury yacht charter or with your own private yacht you’re guaranteed a memorable adventure. 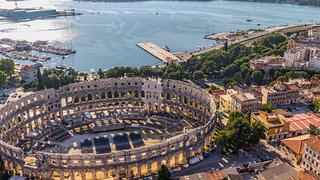 Fly to Pula in Istria and take in the sunset around Pula’s remarkable Roman amphitheatre. Even better, if it’s film festival time you can catch an open-air screening inside the arena. Dine in style at Valsabbion and savour innovative cuisine using the best of the region’s produce. After dinner, rejuvenate and enjoy the view from Valsabbion’s top floor spa and sleep the night away in the luxury of its exquisite rooms. Join your captain and crew and set sail for a lunchtime stop at Restaurant Viking in the Limski Fjord. Taste fresh mussels and oysters, admire the dramatic scenery of the canyon, and imagine the time when Richard Widmark was making the classic film, The Long Ships, here. Then head back south to appreciate the view of charming Rovinj enroute to the Brijuni Islands, Tito’s favourite playground. Anchor in the idyllic bay of Mali Brijun, one of the best superyacht anchorages in Croatia, ready to take advantage of one of the best superyacht destinations Croatia has to offer. Join your captain and crew and set sail for a lunchtime stop at Restaurant Viking in the Limski Fjord. Taste fresh mussels and oysters, admire the dramatic scenery of the canyon, and imagine the time when Richard Widmark was making the classic film, The Long Ships, here. Then head back south to appreciate the view of charming Rovinj enroute to the Brijuni Islands, Tito’s favourite playground. Anchor in the idyllic bay of Mali Brijun, one of the best superyacht anchorages in Croatia, ready to take advantage of one of the best superyacht destinations Croatia has to offer. Take in a round of golf, explore the museums and set sail after lunch for the island of Lošinj. Anchor off Mali Lošinj for the afternoon to swim, snorkel or catch sight of the dolphins. Then head for Rab for the night, and moor alongside the pier outside the town’s marina. Approaching at dusk, you’ll see the silhouette of the town and its four bell towers resembling a four-masted ship. For dinner onboard try the sweet fortified wine, Prošec, as an aperitif. Wash down wafer thin smoked ham (pršut) and sheep’s cheese with a glass of red Plavac Mali, and the catch of the day with white Pošip. Meat lovers can enjoy the delicate and unique flavours of the oven-baked lamb from neighbouring Pag. Take in a round of golf, explore the museums and set sail after lunch for the island of Lošinj. Anchor off Mali Lošinj for the afternoon to swim, snorkel or catch sight of the dolphins. Then head for Rab for the night, and moor alongside the pier outside the town’s marina. Approaching at dusk, you’ll see the silhouette of the town and its four bell towers resembling a four-masted ship. For dinner onboard try the sweet fortified wine, Prošec, as an aperitif. Wash down wafer thin smoked ham (pršut) and sheep’s cheese with a glass of red Plavac Mali, and the catch of the day with white Pošip. Meat lovers can enjoy the delicate and unique flavours of the oven-baked lamb from neighbouring Pag. Head for Zadar, past the long, thin island of Pag, also known for its cheese, lace and party scene. Moor up in the outer part of Marina Zadar Tankerkomerc and enjoy the city. Wander around the museums, check out the boutiques and absorb the ambience and history. Watch the sunset that Alfred Hitchcock adored whilst dining in old-fashioned style at Fosa. Then take a gentle stroll around the old town peninsula to appreciate the spectacle of the Greeting to the Sun, accompanied by the haunting notes of the Sea Organ. For cocktails and a live performance, settle down in The Arsenal before finding one of the traditional rowing boats (barkarioli) to ferry you back over the bay. Head for Zadar, past the long, thin island of Pag, also known for its cheese, lace and party scene. 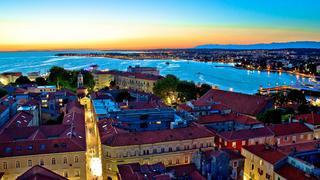 Moor up in the outer part of Marina Zadar Tankerkomerc and enjoy the city. Wander around the museums, check out the boutiques and absorb the ambience and history. Watch the sunset that Alfred Hitchcock adored whilst dining in old-fashioned style at Fosa. Then take a gentle stroll around the old town peninsula to appreciate the spectacle of the Greeting to the Sun, accompanied by the haunting notes of the Sea Organ. For cocktails and a live performance, settle down in The Arsenal before finding one of the traditional rowing boats (barkarioli) to ferry you back over the bay. Today it’s back to nature. 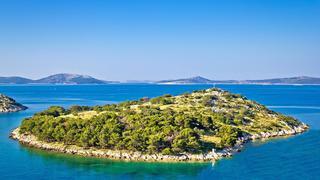 Make the short hop for Luka Telascica and drop anchor in its soothing protected bay. A short dinghy ride to Katina islet offers a casual lunch at Mares for the best fresh fish cooked in traditional Kornati style. Swim in the saltwater lake Mir, and dine aboard under the stars to the accompaniment of the sounds of nature. Drink in the stillness and wild beauty of the Kornati islands as you make an early start for Šibenik and Krka. For another unforgettable rustic lunch, drop anchor between Ravni Zakan and Kameni Zakan and take the dinghy to Konoba Larus on Ravni Zakan. Back on your yacht as you sail past the unspoilt islands of the Šibenik archipelago and head up the Krka estuary, there’s the chance to admire the cathedral and fortresses of Šibenik, as you pass on the way to Skradin. Drop anchor and moor stern-to on the northeast quay, west of the breakwater. Take tapas and sample good local wines at Alante, next to Skradin’s one hotel, or dine at Zlatne Skoljke. Drink in the stillness and wild beauty of the Kornati islands as you make an early start for Šibenik and Krka. For another unforgettable rustic lunch, drop anchor between Ravni Zakan and Kameni Zakan and take the dinghy to Konoba Larus on Ravni Zakan. Back on your yacht as you sail past the unspoilt islands of the Šibenik archipelago and head up the Krka estuary, there’s the chance to admire the cathedral and fortresses of Šibenik, as you pass on the way to Skradin. Drop anchor and moor stern-to on the northeast quay, west of the breakwater. Take tapas and sample good local wines at Alante, next to Skradin’s one hotel, or dine at Zlatne Skoljke. Back to nature again for a morning swim beneath the Krka waterfalls and a stroll around its majestic cascades. Then it’s a return to Šibenik, to moor opposite the cathedral and take in brunch or lunch in Pelegrini, next door. This refreshingly different, wine-bar style restaurant has the most incredible vistas – the cathedral, the estuary, the main town square and a terrace amongst the old wells of the Bunari museum. The menu is tantalisingly different and one of the rare places you can find bacon and eggs. Re-energised, head on to Rogoznica where you can moor at the classy Marina Frapa or anchor in Uvala Soline. Dine casually in Rogoznica or in style in the marina. Take a flutter in Frapa’s Casino, or sip champagne in the bar. 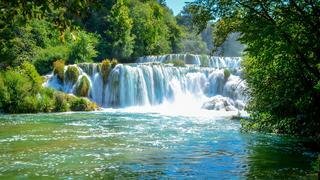 Back to nature again for a morning swim beneath the Krka waterfalls and a stroll around its majestic cascades. Then it’s a return to Šibenik, to moor opposite the cathedral and take in brunch or lunch in Pelegrini, next door. This refreshingly different, wine-bar style restaurant has the most incredible vistas – the cathedral, the estuary, the main town square and a terrace amongst the old wells of the Bunari museum. The menu is tantalisingly different and one of the rare places you can find bacon and eggs. Re-energised, head on to Rogoznica where you can moor at the classy Marina Frapa or anchor in Uvala Soline. Dine casually in Rogoznica or in style in the marina. Take a flutter in Frapa’s Casino, or sip champagne in the bar. 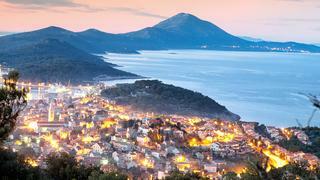 Take a gentle sail to the Drvenik islands and drop anchor between Drvenik Veli and Krknjas Veli. Swim in the clearest waters you could imagine and dinghy to the beach for an exquisite early lunch in the tranquil cottage garden scenery of Konoba Krknjasi. Then it’s off to Trogir to berth alongside the buzzing Riva and home via Split Airport if you can tear yourself away from the innumerable charms of Trogir. If you have time to spare before catching the plane, drive past the airport and take a right turn to Kastel Novi or Kaste Luksic where you can sip a delicious last coffee admiring the view of Kastel Bay and speculating on the investment potential of the old stone houses. 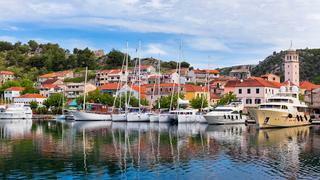 Take a gentle sail to the Drvenik islands and drop anchor between Drvenik Veli and Krknjas Veli. Swim in the clearest waters you could imagine and dinghy to the beach for an exquisite early lunch in the tranquil cottage garden scenery of Konoba Krknjasi. Then it’s off to Trogir to berth alongside the buzzing Riva and home via Split Airport if you can tear yourself away from the innumerable charms of Trogir. If you have time to spare before catching the plane, drive past the airport and take a right turn to Kastel Novi or Kaste Luksic where you can sip a delicious last coffee admiring the view of Kastel Bay and speculating on the investment potential of the old stone houses.